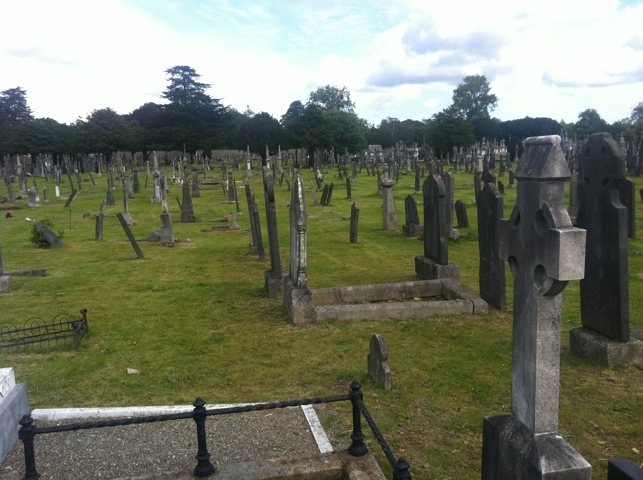 Cemeteries as large as Glasnevin have their own neighbourhoods: modern and tawdry, old and dilapidated, grand and fenced off. I’m not sure that I want to set aside money to take up space in a place like this. We all moulder in the end – everything else is an effort to be remembered, and for that purpose I’d rather use paper than stone. I really think this should be considered more then a test – it’s a lovely little piece of writing. I was struck by how many cemeteries there seemed to be in Ireland, and how grand even the most overgrown of them felt to my new California soul. So fascinating, so visually/contextually appealing… yet so unappealing at the same time. I’ve been thinking about this for a few days since this post, and… I keep wondering why the idea of *not* being remembered after I’m gone, not even on paper (screen? ), is almost peaceful to me. Somehow the thought of being dust that scatters in the wind — and disappears for all but those who are looking for it — seems natural, and beautiful. I wonder if I’m missing something? Wanting to be remembered after you’re gone is part of the yearning for something bigger than yourself, I suppose, which is why it ties into religion so easily. I quite like the attitude of being willing to just dissolve and be gone, but there’s a bit too much of the writerly egoist in me to just accept it. Something to work on, perhaps.